THE ONE IN WHICH I GET AN AGENT! So, this was the month *it* happened. The month I signed to an agent. It’s been thrilling! Exhilarating, overwhelming and probably not an exaggeration to say one of the most exciting things ever to happen to me. In fact, I was lucky enough to have a little flurry of interest from several agents. And two rejections - there are always rejections, aren’t there? Then Felicity Trew from the Caroline Sheldon Literary Agency sent me a lovely email saying how much she had enjoyed the book and how she’d stayed in her dressing gown all Sunday to finish it and would I like to come up to London to discuss it with her? Wow! I’d seen Felicity speak at the RNA Conference last year and really liked her energy and enthusiasm and obvious passion - and she was one the Bookseller’s Rising Stars of 2016 - and, running a boutique agency myself, I was keen to be represent by one …. Anyway, it was safe to say I was very, very excited. And funnily enough, when I saw where the agency is - three minutes’ walk from Notting Hill Gate - that was the icing on the cake. Not that I’d chose an agent based solely on location, obviously, but Notting Hill has a very special place in my heart. My uncle and late aunt used to have an antiques stall on the Portobello market and my sisters and I would visit the market on a Friday, buy some old tat and then spend the afternoon cleaning it up before trying to flog it on the stall the next day. Oh, the excitement! When I was about ten, I bought a silver spoon for 20p and sold it for £2.50 and then there was that little teak condiment set that made £3 profit and …. Anyway, I digress! I met the same uncle - now 90 and still living the high-life - for lunch and then went to meet Felicity, Caroline and Georgia at the agency and then Felicity swept me down the street to Polpo for tea. We got on like a house on fire and then she offered to represent me and said she’d like to take my book to The London Book Fair later that week. Honestly, it was brilliant! I was so excited that I couldn’t finish the gorgeous orange meringue I’d ordered. I finished the bubbly though. So here am I with an agent and feeling a curious mixture of pride, relief, excitement and fear. To be honest, it feels a bit weird. When you decide to attempt the traditional publishing route, getting an agent becomes everything. It’s almost the goal in itself and you have shamefully little idea of what happens next. Or, at least, I don’t. It’s a bit like scrambling up a very steep hill with lots of slipping and sliding and once you haul yourself over the edge, yes, there’s the gorgeous vista you’d hoped for but there but there are also mountains in the distance and you realise you have no idea how to scale them. Luckily, I’m now part of a team and I love the feeling of moving from ‘me’ to ‘us’. It’s wonderful discussing possible editorial and title changes with someone who not only ‘gets’ my book but also loves it and is really excited to be representing it and me. I’m very, very happy indeed! And I’d like to say a huge thank you to everyone who has supported me along the way and who has shared in my excitement over the last week or so. 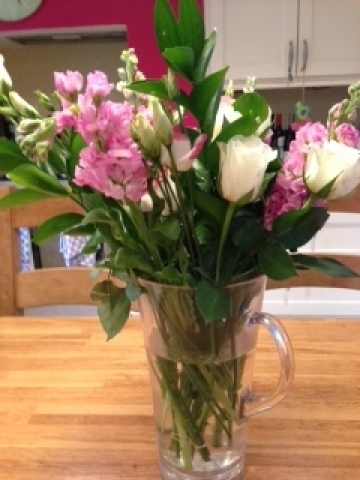 Thanks so much for the messages and the cards and the flowers. What lovely news! Congratulations, Kirsten. As a former NWS member myself, I know how thrilled you must be. Well done! Many congratulations, Kirsten. Welcome to the agency, Felicity is my agent too and absolutely brilliant. Such amazing news. I’m so excited for you. Can’t wait to see what happens next. Well done, Kirsten! Wow! Look at all these lovely comments. 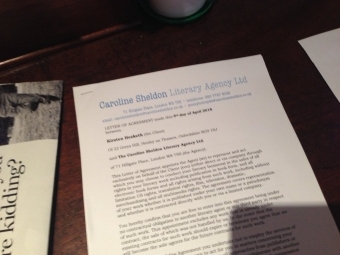 I told Kirsten that everyone would be thrilled to read her 'official' announcement - and here's the proof. Vanessa, Julie, Kitty, Jan, Cass and Sue - many thanks to all of you for your kind comments and for supporting Kirsten's guest blog. That's such a lovely read, Kirsten, and Thankyou Susanna for hosting it! I too thought Felicity was great at last year's Conference- how fantastic that you both gelled in so many ways. Yaaaay! So so so happy for you, Kirsten. It's been amazing following your journey so far, and I can't wait for the next instalment. Scaling those mountains will be an exhilarating ride with your support team around you! It was so good to read this particular post, Kirsten. I’m thrilled for you. Your excitement at getting an agent shines through every word. I’m so pleased that you and Felicity got on so well and hope that a publisher snaps up your book very soon. Huge congratulations! You didn't finish the meringue? Insanity. Massive congratulations, you know I can't wait! On 27th April, 2018 by Kitty Wilson. Congratulations Kirsten - I'm thrilled for you and your enthusiasm is infectious. I hope your search for a publisher is successful and I can't wait to hear about the publication of your book! Thanks for sending Kirsten your good wishes, Maddie. It is such wonderful news. I'm proud Kirsten made her announcement on my blog.